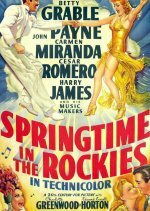 Soon-to-be-wed Betty Grable and Harry James appear together in one of the better, garish Technicolor musicals produced by 20th Century-Fox during the Second World War. Grable and John Payne play a sparring Broadway duo, and that's all you really need to know! The music includes the wonderful Helen Forrest performing Harry Warren and Mack Gordon's 'I Had the Craziest Dream', and the supporting cast includes such eccentrics as Carmen Miranda (attempting Chattanooga Choo Choo), Charlotte Greenwood, and the redoubtable Edward Everett Horton. Young, in love and cleverly choreographed by Hermes Pan, Grable expertly showed off her slim talents to best effect, and confidently consolidated her stardom on her way to becoming the Forces' pin-up.